Contrary to popular belief – email marketing is not dead. Nielsen even indicates that it’s one of the best ways to encourage your customers to take action. 81% of retailers have indicated that email marketing is their most effective avenue for driving customer acquisition and retention (followed closely by social media). There are many advantages to creating a symbiotic relationship between email and social media. Email is the most direct channel. While it boasts a higher ROI than any other channel, it also helps build loyalty and relationships with your customers. Even more, the backbone of your marketing efforts is the data you are able to collect. Marketers try to capture email addresses across all channels as attaining email addresses opens up the floodgates of marketing. You can track click data, do behavioral targeting on your site, and use these insights to inform your mobile, social media, and in-store strategies. 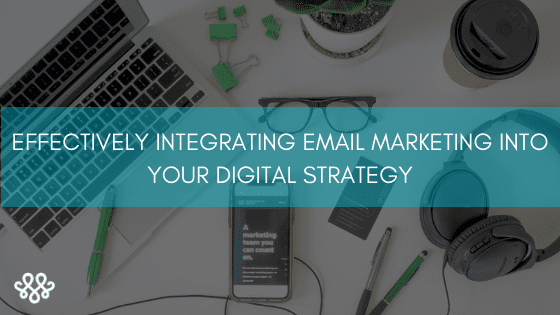 Here are a few ways you can effectively integrate email into your marketing strategy. Your website, blog content, video (and more) should be working together with your email marketing efforts to serve your audience and get you closer to your content marketing goals (whether that be leads, conversions, or brand recognition). For instance, sending out a monthly newsletter that includes links to your best blog posts or important industry news will allow you to repurpose content you’ve already published and gain new leads with used material. Adding an email subscribe option to your website and blog posts will give people the opportunity to be involved in more of your platforms. This is especially helpful if consumers are at the beginning of the purchase funnel and not ready to make a conversion. Email marketing keeps potential consumers engaged with your brand, even if they’re not currently converting. Essentially, you’re keeping your brand name in the eyes of those who eventually will need what you’re selling. When they think of your product, they’ll think of you. That being said, your emails should be targeted and filled with content that is focused on pursuing your marketing goals. The way you do this will be dependent on your type of business and your marketing goals. It might be most effective for you to divide your list based on how you received the contact information. Did they subscribe to your newsletter? Did they fill out a specific form on your website? Example: Say you sell a variety of eye glasses. You might have a test on your website to test for color blindness. If someone fills out this test, it would be to your advantage to send them a follow-up email that includes their results and next steps for purchasing color-correcting lenses depending on their diagnosis. On the other hand, if someone visits your site and doesn’t fill out that form – it’s very possible that they’re not experiencing color blindness and a blanket email about color-correcting lenses won’t be affective for this user. That’s why it’s vital to segment your lists. Your consumers should always be getting the most relevant information to their unique situation. Tools like Mailchimp allow you to combine, segment and create tags within a list so you can manage information more effectively. If your goal is to increase online sales of a certain product, then your call-to-action shouldn’t be your company’s phone number or a link to your contact page. While this example seems simple, a lot of businesses don’t realize the importance of a well-placed call-to-action. Consumers don’t want to have to look too hard for your product, so you have to put in the effort to make sure they can find it. Link images to individual products so customers can find exactly what they’re looking for with the click of ONE button. You can include a general link to your website in the footer of your email, but we’d advise keeping it out of your call-to-actions. By simply adding social sharing or follow buttons to your emails it can extend the reach beyond just your email leads list. It also will expand the visibility of your content and your brand. Including your social platforms within an email allows users to find your content in another area. Social media also has added benefits you don’t get with email. With social, it is okay to post more frequently and you can engage with users conversationally. Email marketing can help increase engagement on social media by reminding subscribers that your brand has an active voice. Another way to integrate email and social together is to send out an email specifically about your social media platforms. 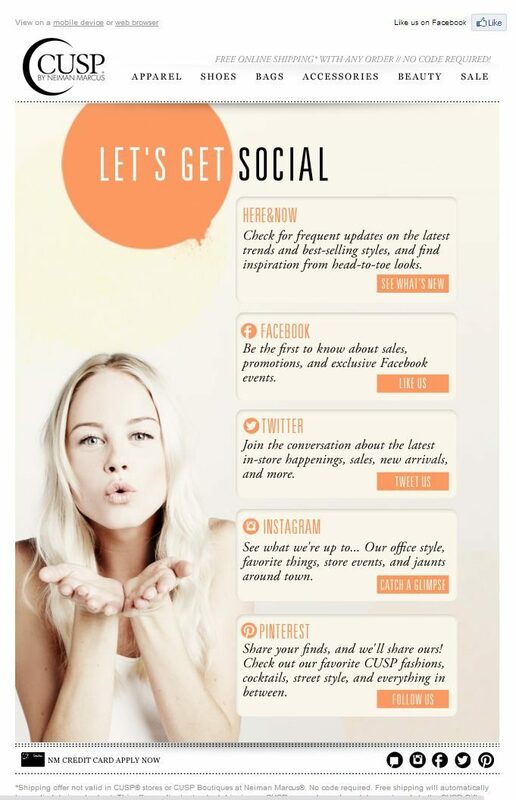 Check out this example: Neiman Marcus encourages subscribers to engage with their brand in a fun and interactive way through this email. They explain the benefit of social media to their brand and what you’ll get from their channels. This strategy not only helps increase engagement on social media, but it also gives subscribers’ value. Tools like this can help keep them even more connected to your brand. By focusing on the promotion of one social network– rather than three or four– it makes it easy for subscribers to make a decision about what action to take such as following your brand on Facebook for updates. Encourage people to sign up for your email lists via social. You can promote your brand’s social media profiles in your emails, but you can also encourage social media followers to sign up for your mailing lists. Your audience will be reminded in your social media of the cool stuff that happens on your email list, while encouraging them to join. For example, Birchbox teases the benefits of signing up for their email list in many of their Facebook posts. They share that people on the email list get exclusive offers and deals. In the example below, you can see that IdealShape utilizes their cover photo to run a campaign that boosts email subscriptions. Fun, engaging posts help users realize the value you have to offer them! Leverage your social media presence to give followers a reason to subscribe to your email list and advance their relationship with your brand. A consideration is placing a call-to-action on your social pages or website. Make sure you announce the clear benefits to your email subscription. A consumer focused strategy can turn your social media followers into subscribers. Sometimes just including social icons is not enough. Remember: While many subscribers recognize the social platforms like Facebook, Instagram or Twitter icons, not all know what action to take when they see them. So, to solve this problem make a direct statement and call to action, so your followers know exactly what to do. According to the latest US Consumer Device Preference Report from MovableInk, mobile email opens surged to an all-time high in Q4. The report says that 66 percent of all email in the US is now opened and read on smartphones or tablets. Email integration is imperative with the growing use of mobile devices. So what do you need to do to make your email strategy mobile? Start by testing your email templates to see how they look on different mobile devices. Again, make sure your call-to-action buttons and links can be easily seen and clicked by readers using touch screens. Offer a “View email in browser” option. Since your images may not display, pay attention to the descriptions of your alt text under the images. Remember your email is just the beginning of the process. Make sure the landing pages and forms that your email links to are optimized for mobile as well. An email strategy is a must-have for any business, and sporadic, non-targeted email blasts just won’t cut it. Each email campaign should have a dedicated purpose that supports a larger marketing goal. If you’re trying to increase brand awareness your email strategy should reflect that. A lot of times, businesses will have multiple marketing objectives, but don’t let that keep you from maintaining an organized email strategy.